Fireworks are dangerous, loud and can only be used once—that’s what makes them fun. Intel has just made its intentions clear that it wants to completely ruin that fun with its small quadcopters that it calls Shooting Stars. Unfortunately, that’s probably a good idea. In a blog post yesterday, Intel announced that it has made significant progress with its fake fireworks drone program and officially gave it a name. 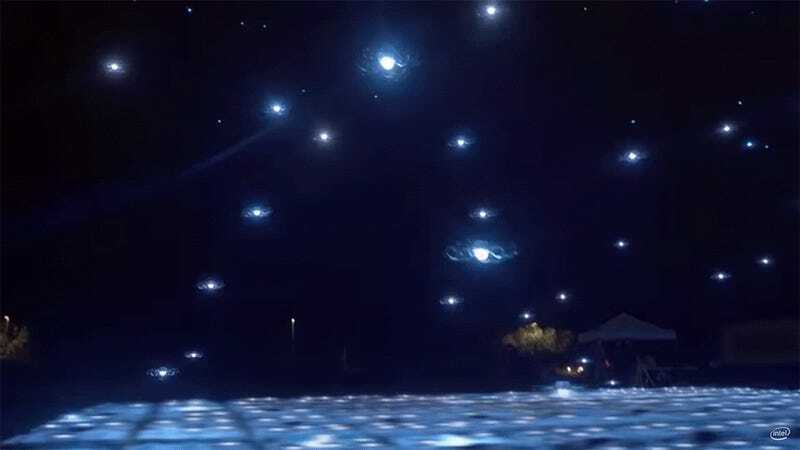 The computer chip giant also claimed victory by setting a new Guinness World Record for most the Most UAVs airborne simultaneously when it flew 500 Shooting Stars to create a spectacular light show. Weighing in at only 280 grams or less than the weight of a volleyball, the Intel Shooting Star drone is constructed with a soft frame made of flexible plastics and foam and contains no screws. The quadcopter’s propellers are also protected by covered cages – all features designed to ensure the drone is safe to fly, is splash-proof and can fly in light rain. The previous world record for simultaneous airborne UAVs was also held by Intel. The company flew 100 quadcopters that were manually pre-programmed to form designs and images in the sky. This just isn’t a practical method as the “fireworks” shows become more complicated. Intel now says that “proprietary algorithms can automate the animation creation process by using an image and quickly calculating the number of drones needed, determining where drones should be placed and formulating the fastest path to create the image in the sky.” The latest version of the tech can operate with just a single pilot. Intel has not announced a price for the Shooting Stars yet and there’s no word on them being available for public sale. It would be surprising if people were allowed to buy this sort of elaborate system privately. The dangers of 500 quadcopters being piloted by a drunk uncle definitely seem higher than lighting off some cherry bombs. As fun and comforting as real-deal, exploding fireworks are, they’re also a ridiculous waste of money for local governments and cause unnecessary injuries. The American Pyrotechnics Association estimates that the U.S. fireworks industry rakes in more than a billion dollars in revenue per year and Americans purchase 285.3 million pounds of the novelty explosives annually. Around 3.5 injuries occur per 100 pounds of fireworks sold. Small-town holiday fireworks displays typically cost about $2,000 to $7,000 for a basic show, according to Premier Pyrotechnics, while the city of Houston spent an estimated $100,000 on its 2016 Fourth of July fireworks show, according to Houston Business Journal. On a grander scale, estimates suggest Macy’s Inc. M, -0.11% may spend $6 million on its annual Fourth of July fireworks show. A recent study in the journal Environmental Science & Technology found that perchlorate contamination in the waters of Oklahoma Lake rises up to 1,028 times above background levels within 14 hours of the July 4 public firework displays held in the US each year. In high doses the chemical is thought to affect the development of the central nervous system in children. A Chinese study found air pollution levels five times higher than normal in Beijing during the 2006 lantern festival, in which fireworks explode around the city. But it’s not like these quadcopter alternatives come without dangerous possibilities. In all seriousness, the Fourth of July is a prime day for terrorism so Intel and any other company better have their cyber security locked up tight.